Now on iPhone, iPad and Android! Hop to the Top for iPhone, iPod Touch and iPad is here! 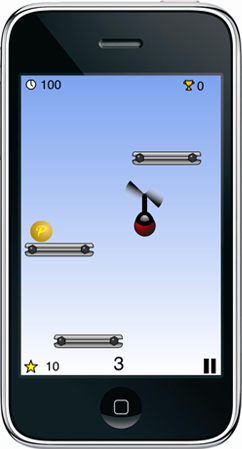 Jump from platform to platform and try to achieve the ultimate score in this addicting platform jumping game! Features three HIGHLY addictive gameplay modes that will keep you endlessly entertained. Heli mode - fly the full time using the helicipter and how far you can heli up! Suicide sprint - Go up as many platforms as you can, but in order for your score to count, you must make it all the way back to the bottom before time runs out! The Lite version (100% FREE) features the regular mode, and allows for unlimited play on any of the time selections. Click here to download it for FREE from the app store. Jump from platform to platform and try to achieve the ultimate score in this addicting platform jumping game! Play! Wrestle your way to victory in this addictive sumo-wrestling game containing three exciting gameplay modes. Play! Your snow fort is under attack. Defend it at all costs against the ruthless snow army. Play! Fast paced and exciting arcade game. Railroad Ruckus! Play! Santa needs your help! Run his sweat shop in this fun and exciting tycoon like Christmas game. Play!